Easy peasy real food is the name of the “game” around here. Today’s recipe couldn’t be any easier! In fact, this recipe is so easy it can be made in less than ten minutes from start to finish. 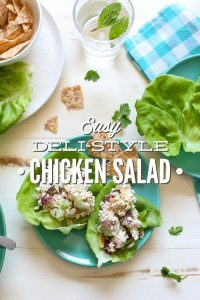 Ten minutes and four ingredients are all you need to create a nutrient-rich, flavorful side dish. 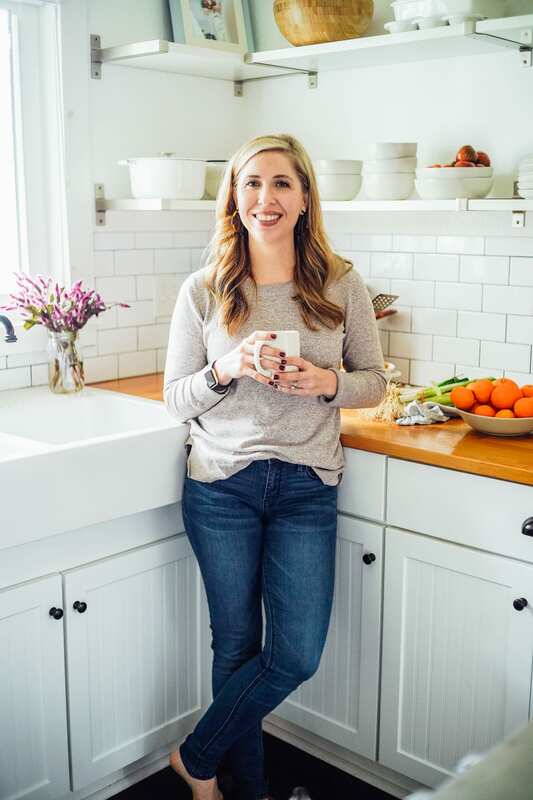 Two weeks ago I started a new series here on Live Simply talking about prepping food in advance. So far we’ve talked about the basics–the how, what, and why. 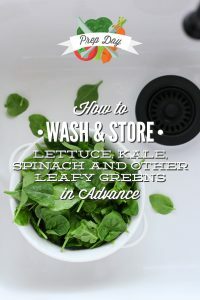 Last week, I shared the first hands-on prep day lesson: How to Wash and Store Lettuce, Kale, Spinach and Other Leafy Greens in Advance. My goal for this series is to equip you (and me) with practical “how to’s” to make prep day a simple and enjoyable activity. 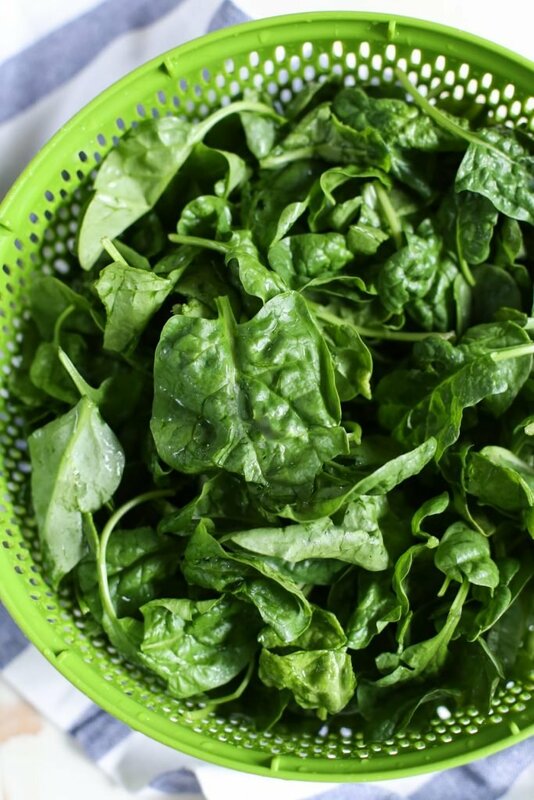 Now that we have a bunch of ready-to-go leafy greens sitting in the fridge, it’s time to talk about how to use them. I typically purchase/grow the following leafy greens: lettuce, chard, sometimes collard greens, Lacinato kale, and baby spinach. I’m trying to expand into other categories like dandelion and mustard greens, but I just can’t get past their unusual taste. 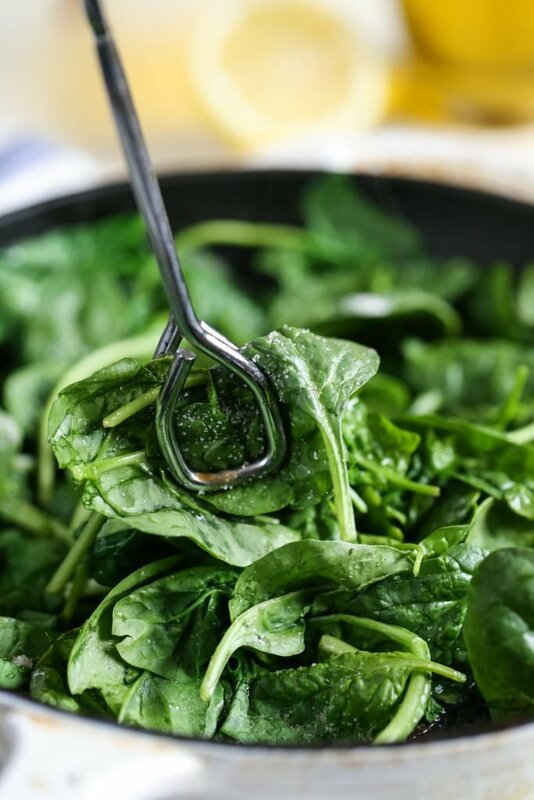 If you have a suggestion for enjoying these greens, please let me know! For now, I stick with the greens I know will actually be used in my recipes. So how do I use the leafy greens I purchase and/or grow? The lettuce is used for salads. I know, a bit boring! Hey, I love a good weeknight salad covered in a homemade dressing. 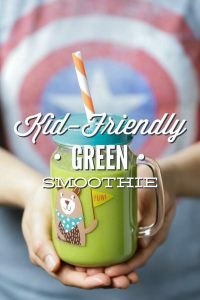 The chard, baby spinach, and kale are used for smoothies and green juices. The kale is also made into chips. And the collard greens are often perfectly seasoned with bacon or used for wraps. 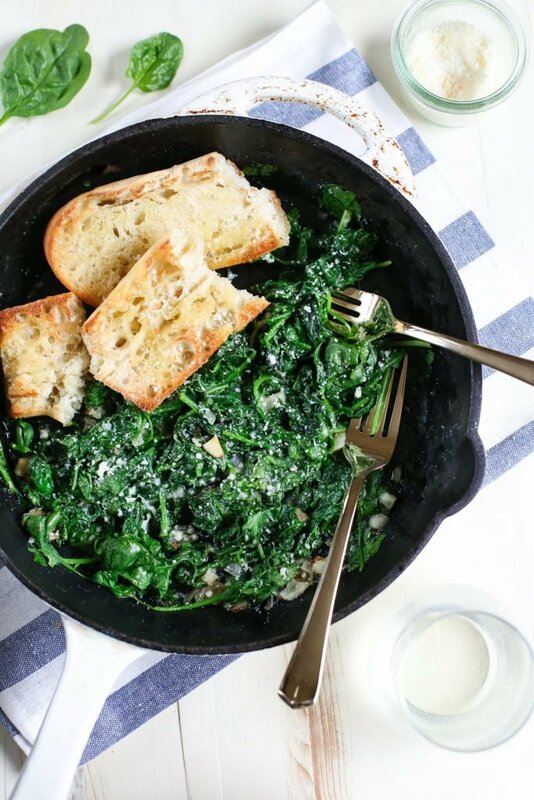 My ultimate favorite way to use any leafy green is in a simple sauté with a bit of olive oil, shallots, crushed garlic, and freshly grated parmesan cheese. A dish that’s not only easy, but one that also pairs well with just about any main dish. Shall we enjoy some easy sautéed greens today? I knew you would be up for it! 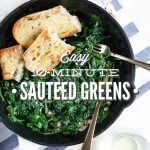 Ten minutes sits between our virtual dinning room table and my favorite cast iron skillet filled with garlicky and cheesy greens that are loaded with nutrients! Why not, right?! Since the greens have already been prepped, let’s start cooking! In a large skillet, over medium-high heat, add the olive oil, garlic and shallots. Sauté for 2 minutes, until fragrant. 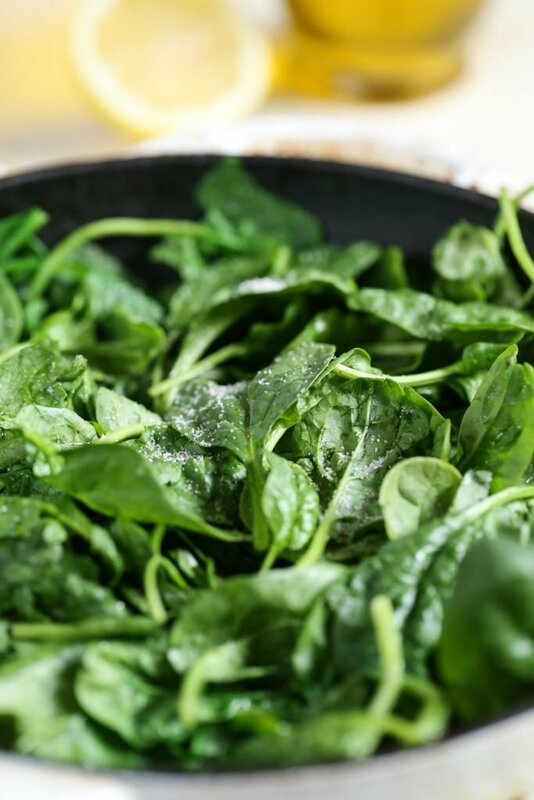 Add the leafy greens to the pan and cook for 1-2 minutes to allow the greens on the bottom of the skillet to slightly cook down. Cook for 2-3 minutes longer, gently turning the greens with tongs every few seconds. Once the greens are reduced and cooked down, turn off the heat and add a pinch of salt/pepper and parmesan cheese. Serve warm. 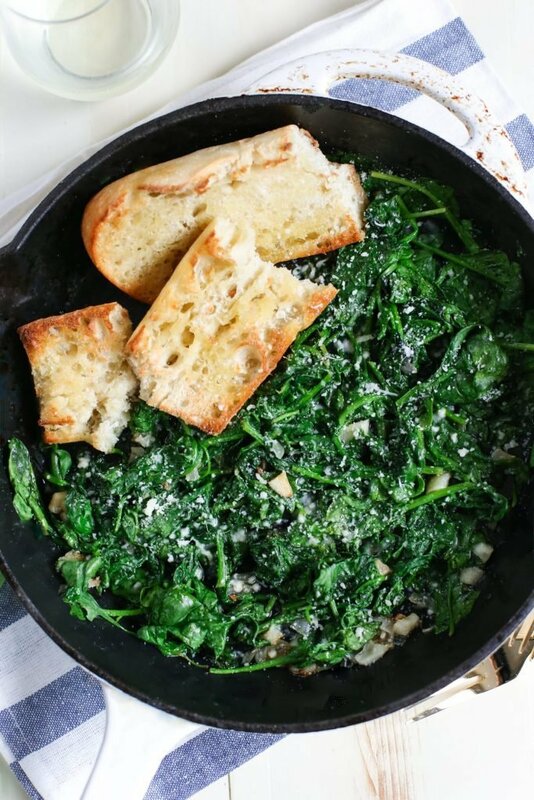 I love to serve sautéed greens on a baguette that's been drizzled with olive oil and toasted under the broiler. * To crush the garlic cloves: Use the back of a wooden spoon to crush the garlic cloves. Then, roughly chop the garlic with a knife. The crushing action releases the flavor of the garlic.